Slipping under the radar Monday, the same day the FAA laid off 1,500 air traffic controllers causing flight delays nationwide, the TSA announced it is delaying a decision to allow small pocketknives back on planes. A federal game of chicken is responsible for the layoffs, with the Republican-controlled Congress forcing deep across-the-board government cutbacks through a timid and ill-advised act of non-governing, called a “sequester.” Keeping knives off airplanes, on the other hand, is the result of an aggressive and courageous campaign by the nation’s flight attendants to demonstrate dangers the TSA has been quick to dismiss. Technically, the policy to allow the knives back on planes, announced by TSA chief John Pistole, is being delayed for a report from a committee representing the airline industry, passenger advocates and law-enforcement experts, but the reality is TSA blinked because of the unrelenting opposition from flight attendants and air marshals, who would be forced to deal with any knife-wielding assailant in a cabin. The Coalition of Flight Attendant Unions, representing nearly 100,000 flight attendants at most airlines, “remains resolute: No Knives on Planes Ever Again,” Flight Attendants stated in a bulletin to members Monday night. The delay will allow them to continue making their very dramatic case for air passenger safety. As flight attendants have pointed out, small knives and box-cutters were the weapons of choice by terrorists who hijacked four flights on September 11, 2001, turned first on flight attendants. While airlines have fortified cockpits to ensure that they cannot be broken into, the safety of passengers and crew in the cabin cannot be assured if knives are allowed back on planes. Flight attendants have made this case in testimony before Congress and in numerous TV and newspaper interviews over the past six weeks. They’ve enlisted the help of survivors from the 9/11 attack, which killed 25 flight attendants among the air crews, to visit Washington and personally lobby their members of Congress. Nelson, a Boston-based flight attendant who lost friends in the 9/11 terrorist attack, says the TSA is making a mistake by focusing exclusively on international terrorism. In fact, as she points out in a New York Times op-ed, flight attendants all-too-often are terrorized by aggressive and out-of-control passengers, and allowing knives on planes will exacerbate the problem. 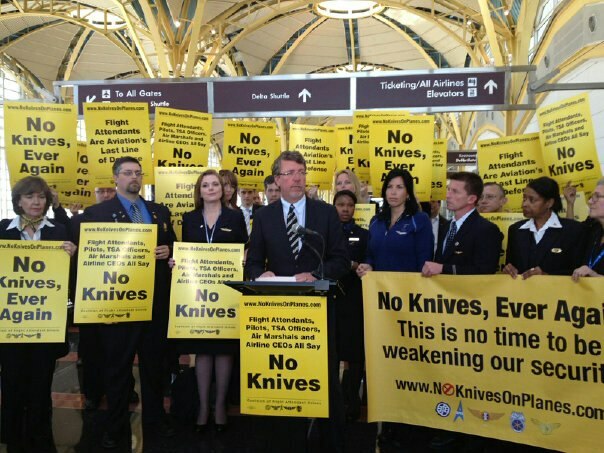 Even TSA agents are opposed to the proposal to allow knives back on planes, explains David Borer, representing the 25,000 employees for the American Federation of Government Employees at a Capitol Hill press conference. While TSA chief Pistole says lifting the ban would allow the agency to concentrate on explosive devices that could take down an airplane, TSA agents themselves have formally opposed the policy change through their union, the American Federation of Government Employees. It’s not as if the screening for pocketknives takes any time away from the screening for explosive material. Yes, the public interest demands that TSA thwart plans by terrorists to hijack and bring down aircraft. But it also demands that passengers not bring dangerous weapons on board planes, no matter what the knife lobby says. For the safety of passengers and crew, we should keep knives off planes. It goes beyond terrorism to day-to-day propriety and order. Why arm passengers who may be unruly, or in altered states. Pistole has certainly not made the case that greater air security demands that we expose flight attendants and passengers to potentially dangerous knife-wielding passengers. 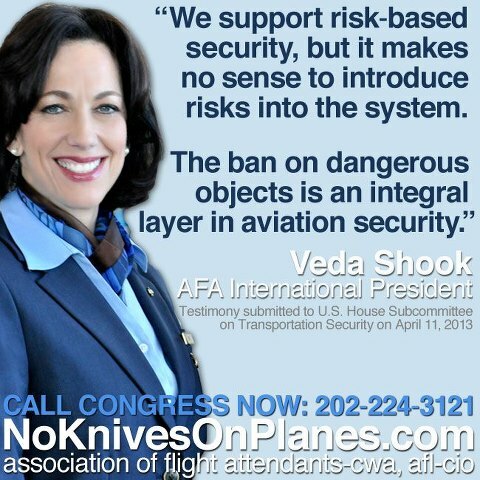 As Veda Shook, president of AFA said in her testimony to Congress, “Why introduce risks into the air security system?” TSA should not allow knives on planes.